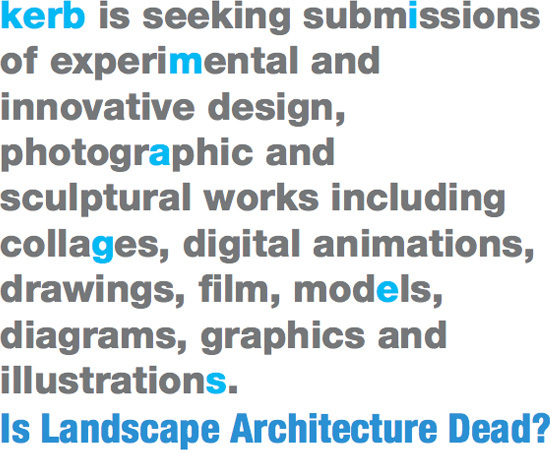 Last month we alerted readers that kerb was looking for article submissions for their 17th issue: Death of Landscape. The deadline has past, but there is still a way for you to contribute. The editorial team wants some images. Does Landscape Architecture have the capacity to deal with the potentials of the future? What is the future of Landscape Architecture? How can landscape be shaped by concepts/models/ideas/theories that are not normally considered relevant to Landscape? Send your illustrative answers to kerb@ems.rmit.edu.au. Show them its rotting corpse in the overgrown lawns of Foreclosure, Florida or its perfumed diseased body getting further irradiated by a Middle Eastern sun. Perhaps you have evidence that it's actually flourishing in the toxic landscape of the Pontine Marshes and in the Pleistocene Park? Whatever you've got, keep in mind that the due date is 17 October 2008. Ok, Landscape is definitely influenced by all kinds of things, including environmental issues, the economy, cultural heritage, technological innovations, and more. I don't see how or why they are postulating the death of landscape. If anything, the spaces between buildings are more important now than ever. While you could argue there are landscapes of death, i don't believe landscape architecture is dead. It's silly to propose that it might be dead during a time when there's a resurgence of interest in the field. Your comments are the sort of responses that kerb is trying to elicit from people. Hope you guys submit some images in light of your opinions. The theme is meant to provoke, and here, it got two strong positions. Could it also provoke a different appraisal? I can only wait for the issue to come out or for comments here to find out.